As an important birthplace of Lingnan culture, Foshan is undoubtedly an ideal place for visitors to explore the unique culture here. Qinhui Garden locates on Qinghui road in Daliang Shunde, which is a masterpiece of southern classical garden art. Foshan Ancient Nanfeng Kilnscenic spot locates in the famous ceramics city Shiwan in southern area. Bruce Lee’s ancestral home and former residence locate in Shangcun village in Jun’an town. Liang's Garden locates on Songfeng road in Chancheng district, which is a general term for the garden house of Liang family. Every year, more than one million people at home and abroad visit Foshan Zumiao Museum and they are deeply attracted by its profound Taoist culture, Confucius culture, martial art culture and the traditional culture. In order to commemorate the Wing Chun master Mr. Ip Man, Foshan set up the Ip Man Tong in 2002 with the great support of Ip’s descendants in Zumiao. 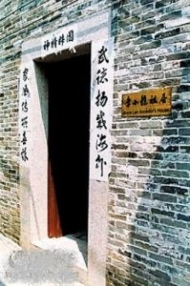 Luo Cun, hometown of Ip Man, as the protection unit of non-material cultural heritage of "Wing Chun, Ip Man Clan" constructed the memorial hall. Foshan set up a Huang Feihong Memorial Hall in the north of Zumiao in 2001, which displays Huang Feihong's whole life in Martial Art. In 1997, the Tourism Department of Xiqiao Town built Wong Fei-Hung Lion Dancing and Martial Art House in Wong's birthplace Luzhou Village. Chen Qiyuan Memorial Hall is located at Yiting Ancestral Shrine of the Chen Clan in Jiancun Village, Xiqiao Town. The 27th China Golden Rooster Hundred Flowers Film Festival was held in Foshan.